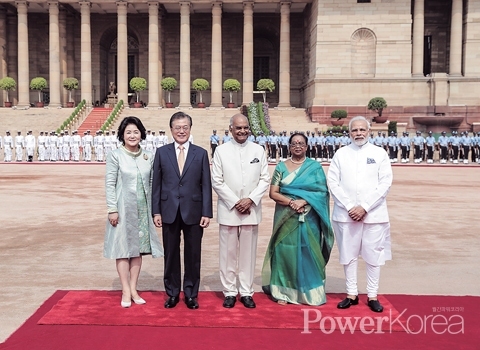 President Moon and Indian counterpart Modi met on July 10 and adopted the Korea-India Vision Statement for people, co-prosperity, peace and future. The two leaders shared the same direction of the Moon’s New Southern Policy and the Modi’s New Eastern Policy and confirmed that they are an important partner of future. Moon and Modi agreed to achieve trade volume of $50 billion US dollars by 2030. The statement includes 1) creating Heo Hwang-ok Memorial Park 2) the earliest settlement of the CEPA (Comprehensive Economic Partnership Agreement) 3) active cooperation in security, defense, terrorism, diplomacy, denuclearization and peace of the Korean Peninsula 4) establishment of Korea-India Future Vision Strategy Group and Research Innovation Cooperation Center for co-research on science and technology. Moon and Modi attended the 1ST Korea-India CEO Round Table on the third day of Moon’s visit to India. 40 representative government and industry officials of both countries exchanged opinions on economy, investment environment and businesses of interest alongside the two leaders on the day. Moon listened attentively to the difficulties of the business environment and encouraged businessmen of both countries and promised that Korea and India will work together to create a better business environment. Some of the renowned companies present on the day were Hyundai Motor, Samsung Electronics, LG Electronics, SK Lubricant, CJ, Lotte, Hanwha Defense, Doosan, KB Financial Group, SG Caltex and Korea Investment Corporation on the Korean side and Mahindra, Reliance Group, Bank of Baroda, Edelweiss Group and Cadila Healthcare on the Indian side. Moon exchanged a talk with the chairman of Mahindra which took over SsangYong Motor and asked him to have a concern over the reemployment issue of the laid-off workers of SsangYong Motor which is still ongoing. Moon received an answer from the chairman that he believed the issue would be nicely settled down on the mutual effort by the management and the labor.